The audio message of this channeling was damaged, but I am happy to share the transcribed message of healing with the angels below. At this time, I invite you to join me in just taking a deep relaxing breath. Close your eyes, and begin to focus your awareness within. At this time I ask that we be surrounded with 100 thousand angels, with divine white light, and with each of our highest, best, most loving possible guides and angels of the light. I ask that each of our teams of angel energy healing guides and angels, please come in. Lift us in vibration and help us to each quiet our minds and open our hearts to tune in to the love, healing, guidance and frequency present at this time. I now invite the highest, best, most loving possible channeling guides who can most serve right now, for this group angel energy healing session. Please come in, connect and channel through me now. Greetings, beloved one. Indeed, we are here, Orion, Archangel Michael, Archangel Raphael, Muriel, Archangel Zadkiel and Archangel Raziel. Know that we merge our energy together now, broadcasting light frequency directly to you and through this channel who receives one word at a time, as a stream of consciousness alongside her own. As you read these words, energy is broadcast into this time and space. Angel energy healing light surrounds you now. A custom blend of light energy, flows into this very time and space surrounding your mind, body and spirit. This light begins its healing work by cleansing and uplifting your aura. As this happens, a larger orb fills the entire space, cleansing your physical location of any and all negativity, along with any and all dense, stuck, or stagnant energy. Negativity in any form is now released into the light, from within your energetic signature, and from within the space, according to divine will, for the highest good. And so, it is. Divine love, light and healing energy are present here and now. Know that you are safe and you are supported by your team of guides and angels who embrace you, who lift you in love. At this time, we invite you to take a deep breath, as you focus within, letting go of thought. And now, feel your energy begin to ground. As you read these words feel your conscious awareness flowing down, grounding down below your feet, conscious awareness flowing down all the way to the light at core of the earth, where you are able to connect with an incredible light therein. Let yourself feel and experience the light at the core of the earth and your oneness with this light and with all that is. And now, at this time, imagine the light at the core of the earth connected to the Divine and connected to all that is, beginning to flow up. It now flows up and in through the bottom of your feet, and in a circular motion, divine healing, love and light flow up and in to the area of your toes and ankles. Visualize and experience light circling around, cleansing, rejuvenating and restoring the divine balance of these energetic centers. And now the light continues to flow up, up along your calves into your knees. In this circular motion still, likened to a towel wringing out, any and all dense energy is released into the light. And your team of angels are on hand to release anything that comes up, here and now in this time and space, into the light of the Divine now allowing increased love which heals, light which replenishes, and energy which rejuvenates to enter in. And so, just imagine and feel the light spiraling up along your legs, and now flowing up into your hips where it serves in activating, balancing and clearing your base chakra, your root chakra with divine light. You may begin to see the color red as this chakra is activated and purified, according to Divine will. And the light now continues to flow up. In this very moment you are surrounded by light of the Divine. You may already feel lighter, you may feel a tingling or pressure at the top of your head, in your arms and legs, or you may feel nothing at all. Either is okay, just trust that the energy is present here and now, flowing, activating, balancing and cleansing your sacral chakra with brilliant orange light, and continuing up to your solar plexus chakra where you begin to see the golden healing light glow. As light continues to stream up your spinal column and up into your heart, we devote a little more light frequency here, shining a spotlight of divine healing upon your heart chakra now, releasing and cleansing out past hurts and wounds, past relationship challenges, cleansing out any energy that is not love. 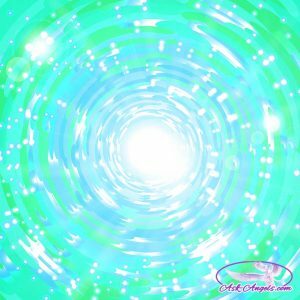 It is through your heart chakra that you are able to connect with and access the divine frequency of the angelic realms. And so, by opening your heart now, by simply thinking of doors opening or whatever visualization works for you is fine. Just open your heart and the light enters in, and your angels help, and your energy elevates, and the healing powered by divine love is able to flow throughout your being. And this energy continues to flow up, now opening, activating, balancing your throat chakra, enabling clear communication, listening and connecting a willingness to speak divine love. And the light continues up to purify, cleanse and activate your third eye and the center of your psychic site, before continuing up into your crown chakra. And now this stream of light flowing up your spinal column continues up into the light. Go up with it; lift up, way up in light and in consciousness to link now directly with God, with the source, with the energy of divine love. Go up, way up, lift up by simply relaxing and lifting up on wings of love; your team of angels, your team of guides support you in this. Lifting you in vibration now, so that you are in the direct presence of source, of God. And through this, you are connected to all that is. You are connected with everything, everything within the earth, within the universe, within the cosmos, within all that is, that you are a part of. Feel this for a moment, this vast connection with all. Know that as you receive healing, it overflows naturally and benefits all. As you carry more light, as you carry more divine love, it naturally overflows outward. And with this in mind, your team of angel energy healing guides and angels step forward, embracing you now with wings of love and drawing your attention to the orb of angel energy healing light around you. And so, in this space, there are individual orbs and there is one large orb, all coexisting, all working together to cleanse out and release any attachments, any dense energy, any energy fragments that do not serve, any earthbound attachments present in this space in anyone or in proximity. Look up and release into the light. Allow yourself, right now, to let go of whatever you have been holding onto that does not serve. Let it go and your angels will reach out and take it and release it into the light of the Divine. And now in its place, unconditional love, compassion, joy and oneness enter in. Let go and let your angels and let God take all that no longer serves, releasing it into the light and replacing it with love. Now, at this time, Archangel Michael steps forward with Archangel Rafael who pulls upon any and all energetic cords. Any and all cords which are draining away energy that is rightfully yours. You may feel a slight pressure as these cords are pulled upon. And Archangel Michael, with his sword of light, cuts any and all cords. At this time, the cords and the roots, and any and all residue are released into the light of the Divine. Witness this release now. This witness may be a feeling, a visual, a thought; let the cords go. These cords may have been attached to people, to certain relationships that are draining to you, or even to your work environment, or to situations of your life. These cords are cut, and now your guardian angel steps forward, assisting you in reclaiming all energy that is rightfully yours, which has been drained, consciously or unconsciously, by others. This energy returns to you now. A golden spiral of light energy flows around this room as the power, light, presence of each returns now cleansed and purified, according to divine will for the highest and greatest good. And so, it is. Breathe and focus within, as you now imagine an orb of light appearing above your head. This orb represents pure divine love, presence, connection, and pure divine source, which manifests as many different qualities: love, abundance, physical healing, healing for the mental body, and healing for the spirit now. At this time, this orb lowers down, lowering down first into your spiritual being. Pure divine essence, pure divine love, lowering down into your aura, and the energy that surrounds you, cleansing this energy and expanding outward to fill out your light body, and expanding the light you are able to carry. So that in every moment you are doing your light work, you are embodying divine presence, you are carrying divine love. Let your mind be calm and let your heart open to experience this download of divine love into your spirit now. Divine love, which is connected to source and which is one with your higher self, the higher vibrational part of you that exists in pure connection with the Divine at all times, and which downloads now into your spirit and into your mind. And so, the presence of your higher self and the angel energy healing of divine love download into your mind, clearing out the clutter of thoughts, the racing of the mind, clearing out the cloud of negativity that can build up. This is released now into the light of the Divine for you, and overflowing for all. Release thought, and through this, you are allowing the full experience of divine love to enter in, divine love downloading into your spirit, into your mind and now into your body. As the energy flows now towards your physical form, let yourself consciously relax, releasing tension from head to toe. As you relax, you are naturally rejuvenated and as you relax, your body is able to be healed. The light around you is now focused and pinpointed by your angel energy healing team so that it flows wherever you need it most. And so, let your awareness be drawn to wherever you could use healing now. And where you focus now, the light flows. Light enters in to this present time and space, divine love is flowing wherever you most need it, according to divine will, guided by your angel energy healing team for the highest and greatest good. And so, it is. The orb of angel energy healing light around you still automatically works to strengthen your aura and to rejuvenate your physical being. From the inner column of light, flowing up from the earth below your feet, connecting with the Divine, and showering down a waterfall of light all around you, it expands outward in a circular flow of light. This energy flow pushes out toxins stored at the cellular level, negativity in your mind, body or spirit, and anything that no longer serves you. Density in any form, negativity in any form, are swept up in the circular motion of light, and are cleansed out and released into the light of the Divine for the highest and greatest good. And so, it is. This energy flow continues according to divine will, as the angels shine a spotlight of divine love wherever you most need it. Again, notice where your attention is drawn and let the light enter in. Archangel Michael steps forward once again with the ascended master El Morya, who places a cylindrical column around your being. This column of light extends down all the way to the core of the earth and extends up all the way into the light of the Divine, into the heavens above, spiraling around, releasing any fear. Any fear energy in your mind, body and spirit is released into the light now, according to divine will. Let it go, release and feel yourself becoming lighter, able to shine brighter, able to take a step into living more authentically in alignment with the truth of the divine spiritual being that you are. For you are physical, yes, with all its many blessings and challenges, but you are more. You are a powerful spiritual being who is connected to the Divine and connected to the angelic realms at all times. And as you clear out the old, tune in to your heart, tune in to the divine love and allow your energy to lift you are able to merge with this full essence of your higher self, of Christ consciousness and pure divine love to embody this. And through this mastery of love, experiencing love, vibrating with love, your energetic signature being strengthened by love, you are naturally healed through the power of love, and you are able to effortlessly overflow the blessings of love around you to others at all times. Love fills this orb of angel energy healing around you, nurturing however you most need. This orb of angel energy healing light takes on whatever color, texture and frequency will most serve you now. You each have a unique orb of angel energy healing light around you. Imagine this circle now expanding around you further, a quantum leap out, surrounding the entire earth, now allowing the healing and clearing energy of divine love to flow to the entire earth. Releasing out fear and negativity, releasing the energy of guilt, of grief, of sadness, of despair … These lower vibrations are lifted up out of you, out of all and released into the light of the Divine, allowing divine love to enter in. The energy continues to flow in through the top of your head, flowing down along your spinal column, grounding you to the earth. And from below your feet, the light flows up in through the bottom of your feet, all the way up your spinal column, out the top of your head, connecting to the Divine. And these two streams of energy meet in your heart. Allow your heart to open. And now, the energy flows out beyond you, out your hands and out your heart, raising the vibration further. Your team of guides and angels empower you now to do this healing work, to send healing to earth, to humanity, to the collective consciousness, to all that is, cleansing out fear, anchoring love, for the highest and greatest good. And so, it is. Any and all entities aligned with negativity in this space and in this circle are released into the light of the Divine. Jesus and Mother Mary step forward, standing at the middle of this large circle, this column of light. And our galactic angels, the Arcturians, step forward with a giant vacuum to vacuum out any and all reptilian energy eggs, programs, and fear based programs of manipulation into the light. Visualize this release for you, if it is required, for humanity into the light for the highest and greatest good. And once again, in the place, divine love, compassion, healing, hope, light, enter in, according to divine will for the highest and greatest good. Breathe and relax. You are surrounded with the divine white light. Breathe it in, feel it filling your mind, body and spirit and, as you exhale, feel any lingering tension, density, negativity, releasing into the light, a gray-like smoke dissolving and dissipating into the light of the Divine. Breathe in the light and, as you exhale, let go. And now the angels hover above, connected to source, connected to divine light, connected to all that is, and flow a final surge of light, a wave of divine and unconditional love, a waterfall of light pours down upon you, all around you, in through your crown chakra at the top of the head, along your spinal column, cleansing your being. And when you are cleansed, filling your aura and your light body with this light of the Divine, the waterfall of light pouring in, releasing negativity, letting it go, allowing love, allowing peace, allowing joy to be experienced here and now. And through this broadcast out ten folds [tenfold,?] a ripple in consciousness, powerful healing work, angel energy healing empowered by divine love. We are pleased to serve you in this way. Whenever you are in need of light, of a boost in energy, simply think, “Angels, connect with me now,” and we will answer without question. “Angels, help!” is all you must think. And we are here. You are so loved, blessed and uplifted. At this time, feel this incredible light energy you’ve tuned in to, beginning to flow down, anchoring it to your physical being, and now flowing down out the bottom of your feet, bringing the energy of divine love to the earth, grounding it into this present moment, connecting you to earth, connecting you to all that is. And through this healing, your mind, body and spirit, healing earth, healing consciousness with the power of love, according to divine will, for the highest and greatest good. And so, it is. We leave you now with our blessing, with the final surge of love, of light, and whatever energy is most needed by you now. Know that the orb of angel energy healing light will remain around you for the next three days. And so, it may take a dare [day?] for you to feel the full extent of this healing, but know that you will feel lighter. It will be easier for you to shine brighter, to stay tuned in to love, for you have been cleansed of fear and density, realigned with the divine love, which you are a part of and which you can connect with at any time by simply opening your heart, entering in, lifting in vibration, and aligning with the infinite supply of divine love, of healing made possible through your direct connection with the source and with all that is. We leave you now with love, with healing, with light. Goodbye for now. Dear Melanie, this channeling was very powerful, Thank you! Would you please record it for us again so we can sit back and enjoy the process? I would really appreciate this if possible. Much love to you and thank you for all the material you give out for free..
Wow…what an Angel Message…this is a very powerful healing. Mother earth and humanity needs all the love and support ,from our lovely Angels…lots of love and light. You gotta make this an mp3 download! Thank you Melanie and healing Angels. This really uplifted my energy. Thank you Melanie and all the wonderful Angels, Archangels, and ascended masters. Thank you Melaxnie and the Angels.